German fashion brand Jil Sander has launched Strictly Jil Sander, a new fragrance for men. Strictly Jil Sander is the masculine counterpart to 2014's Simply Jil Sander. A spicy woody fragrance. Tailored with the precision of a Jil Sander suit, Strictly Jil Sander is the fragrance manifesto of masculine elegance. In the top note, noble white pepper is blended with precious essence of bay to generate an explosion of elegance. The spicy sensation is intensified by the warm aromatic accents of nutmeg in the heart, fusing into a dry-down of vetiver, for a distinctively masculine signature. Absolutely simple. Infinitely comfortable. Utterly seductive. Strictly Jil Sander was developed by perfumers Sonia Constant and Olivier Pescheux. Additional notes include cedar and tonka bean. 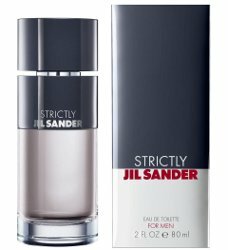 Strictly Jil Sander is available in 40, 60 and 80 ml Eau de Toilette.